"I'm glad I'm not me." Bob Dylan is large, he contains multitudes. As a songwriter he has been brilliant and bruising, inscrutable and incomprehensible; as a public figure he has been omnipresent and elusive, famous but not known. To tell his story in a conventional manner is to miss the very point of Bob Dylan. That's the working premise for Todd Haynes, at least, the director and co-writer of I'm Not There, which is at turns fascinating and maddening, gripping and a little too in love with itself. It sets out both to tell Dylan's story and to withhold it, to be a film biography while making fun of the very notion of telling someone's life in a neat little two-hour package. Your passion for Dylan may well reflect your enthusiasm for this movie. The central conceit of the piece is that not a single actor will be portraying Dylan, but rather his life—or the first portions of it, at least—will be refracted through six different stories, each with a different actor at their center, and each with a different nom de guerre, though operationally we understand that all of them are Dylan. Haynes brings a different visual style to each thread in the strand, reflecting both the man and his times; there's the undeniable vèritè influence, but also homages to Fellini, Richard Lester, John Schlesinger, and the many other directors' use of a distinctly 1960s aesthetic. Things kick off with a joke that's practically a nod to Navin Johnson: this Bob Dylan was born a poor black child, as played by young Marcus Carl Franklin. Christian Bale is the brooding, folk Dylan; Heath Ledger the one going through a nasty marital breakup, from Charlotte Gainsbourg; Richard Gere is the mythical Billy the Kid incarnation, and Ben Whishaw channels the spirit of Rimbaud. Getting the most attention, certainly, is Cate Blanchett as the electric Dylan, whose plugging in at the Newport Jazz Festival made him a folk apostate. If Blanchett weren't so brilliant, this would seem like little more than stunt casting; but Haynes is blessed by her presence, and gets excellent work from all six, even if they don't quite cohere—really, how could they?—as the same person. Haynes seems deliberately to be giving the finger to typical Hollywood biopics, regardless of their quality—he clearly doesn't have the patience or the temperament for movies like The Sopranos or Walk the Line, and he even makes Scorsese seem like an old fogey, as his No Direction Home feels almost pedestrian and linear in comparison. (Scorsese covers pretty much the same territory, as did D.A. Pennebaker, in Dont Look Back.) The problem with much of the movie, though, is that frequently it feels like it's too cool for the room, and that it takes too much for granted. It's got to be most rewarding for those who know Dylan's work intimately; for those of us who are fans but not obsessives, many of the allusions are overly obscure, the setups unrewarded, and as the movie runs more than two hours, it kind of sags in the middle, the jolt provided by its stunt not sustaining us through the whole picture. In many respects, it's the companion piece to Superstar, Haynes' samizdat Karen Carpenter biography, worth seeking out on YouTube or elsewhere, Richard Carpenter and copyright issues be damned. Certainly much of the fun is in picking out stuff you recognize, and so much of early Dylan is so iconic that the eerily accurate re-creation of some documentary footage is startling. (The entire production team deserves a world of credit for their work on the uncanny accuracy to the look of the film.) And the parlor game aspect extends to some of the supporting cast, too, giving wonderful performances in thinly fictionalized or composite versions of very public figures. Julianne Moore is Joan Baez in all but name, for instance, and Michelle Williams nails it as Coco, the Edie Sedgwick stand-in; David Cross is a fantastically whimsical and super groovy Allen Ginsberg; and Bruce Greenwood is dry and sly as a BBC interviewer who can parry with Dylan as well as anyone. It's a great ride, but you get the sense that Haynes thinks that Dylan remains largely unknown, and essentially unknowable. He may be right, and Dylan doesn't owe us any explanation; be prepared to leave even more baffled than when you arrived. Image Transfer Review: Haynes' widescreen compositions recall the best movies of the 1960s, and the anamorphic transfer shows them off well—the inventiveness of the technical elements of the production are rewarded by this DVD set, though the lighter end of the palette tends to get a little wispy and indistinct. Audio Transfer Review: Well, it wouldn't be a Bob Dylan project with any authenticity if you could make out every word. The struggle for balance between dialogue and music on the 5.1 track can be intense; fortunately subtitles are available for both, and you may want to avail yourself of one or the other. Extras Review: The feature has two sets of chapter stops—one for story, one for songs—and both prove useful if you're trying to hunt down that elusive passage. And the two-disc set offers ample opportunities for a crash course in all things Dylan, in many media. Disc One holds the feature, and Todd Haynes' commentary track, which is a terrific one; he's smart and gracious about influences on him and the project, generous about the contributions of the many members of the production team, and is candid about the origins of the film and the Montreal shoot. His track plays out almost like footnotes for the feature, though he's certainly not without emotion—he swells with a parent's pride when he talks about "all of my Dylans," for instance, and becomes deeply emotional while watching the scenes with Heath Ledger, the first time the director had looked at them again since the actor's untimely death. 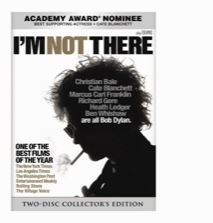 Also on the first disc, under the heading An Introduction to I'm Not There, is the first set of Monarch Notes for the feature. Who's Not There: Six Faces of Dylan is a thumbnail guide to the central sextet, and Decoding an Entertaining Enigma functions in much the same manner. Tangled Up in Clues is an essay by Ann Powers that originally ran in the L.A. Times, and serves as a guide for those of us without Ph.D.s in Dylanology; similarly, Notes on I'm Not There, by Greil Marcus, is a paean from the definitive historian of the Basement Tapes. Disc Two begins with two original trailers, and a fantastically innovative though unused third: it's all six Dylans, in character and period, re-creating the iconic Subterranean Homesick Blues sequence from Dont Look Back. We get two full versions of this trailer, plus raw footage of all six of them tossing aside the sheets of paper with the song's lyrics. From the Edit Room is the next menu option, beginning with audition tapes for Marcus Carl Franklin and Ben Whishaw, the two least known of the Dylans, and continues with two deleted scenes, one showing Blanchett's Dylan on a bad trip, the other allowing Gere to showcase his equestrian skills. Also here are four alternate or extended versions of scenes in the feature, changed or modified for pacing and mood, it seems; the best of them is probably the extended sequence of Dylan in his phase as a born-again minister. A gag reel (4m:14s) is full of flubbed lines, goofy looks and malfunctioning props; much more somber, and quite moving, is a tribute (3m:16s) to the late Heath Ledger, a loving assembly of moments of him not in the final cut. A Look Back kicks off with a brief (2m:42s) look at the film's premiere, in Chelsea, in November 2007; far more substantive is Making the Soundtrack (21m:04s), the authenticity and quality of which is so crucial to the success of the project. Haynes is expansive in a discussion (42m:31s) that inevitably covers some of the same ground as the commentary, but is still worth watching. And the final heading, Dylanography, comes with a biographical chronology, discography, filmography, and bibliography for the man, along with Haynes' original one-page proposal to Dylan for the feature; a New York Times Magazine article by Robert Sullivan on the movie; a filmmaker's notebook section, crammed with storyboards, sketches and notes; and a stills gallery, broken down into six sections, one for each Dylan. Occasionally a little too hipper-than-thou, but, as inspired by its muse, the film is frequently brilliant and riveting, if not always illuminating. Bob Dylan may remain the great sphinx of our popular culture, and no mere feature film can solve him. Still, no shortage of fascinations here, and voluminous extras to back it all up.